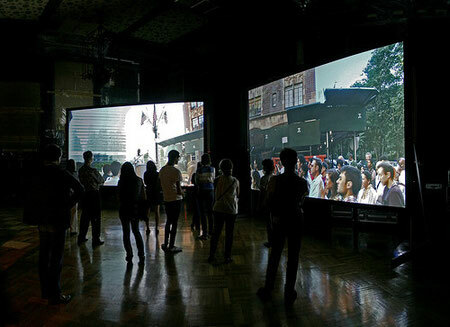 "Democracy in America," organized by Creative Time, Park Avenue Armory, New York City, September 21-27, 2008. The idea behind this installation is to reproduce the Port Huron Project reenactments as an immersive counter-spectacle. I used surround sound and two high-definition video rear-projections to produce an effect of spatial correlation between the reenactments and the exhibition space. The installation visitor feels herself to be almost part of the reenactment audience—nearby yet separated by a screen. This separation reproduces in technological form the performative mediation inherent in reenactment as an artistic form, as well as the historical distance that separates the reenactment from the original event. 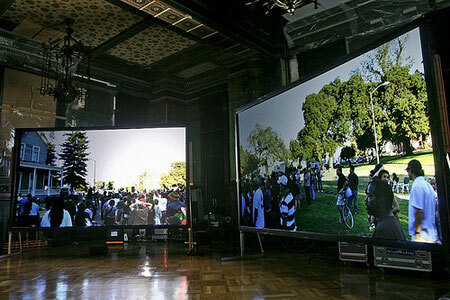 Similar two-screen installations have been exhibited at SITE Santa Fe and at LACE (Los Angeles Contemporary Exhibitions). "Creative Time is pleased to announce the largest public art initiative in its 34-year history, Democracy in America: The National Campaign. A multifaceted project on a national scale, Democracy in America travels across the country to take the temperature of artists’ relationships with and reactions to the historic roots and practical manifestations of the American democratic tradition. Creative Time will promote active participation and open discourse during the 2008 election season and beyond by engaging a diverse community of artists, activists, thinkers, and citizens to create spaces for dialogue, exploration, and congregation. The project includes: a 7-day exhibition at the historic landmark Park Avenue Armory, performative artist commissions from coast to coast and at the RNC and DNC, mobile projects visiting communities in Queens and Brooklyn, and a publication giving artists a platform to reflect on democracy in this country. Democracy in America: The National Campaign is curated by Nato Thompson." "This summer, historic speeches from the heated New Left movements of the 1960s and 70s will be reenacted in artist Mark Tribe’s Port Huron Project, presented by Creative Time as part of its national public art initiative Democracy in America: The National Campaign. Drawing upon the traditions of political demonstration, protest, and public address, the project restages radical speeches selected by the artist to a public audience. The speeches will be presented in the same locations they were first heard roughly four decades ago. Though the texts make direct reference to the Vietnam War and concurrent Civil Rights movements, each was selected for its contemporary relevance—they contain arguments, declarations, and calls to action that are equally evocative and vital today. 'The goal was to use the speeches not just as historical ready-mades or conceptual-art explorations of context,' Tribe says, 'but also as a genuine form of protest, to point out with the help of art how much has changed, yet how much remains the same.' "
A technical diagram of the installation.